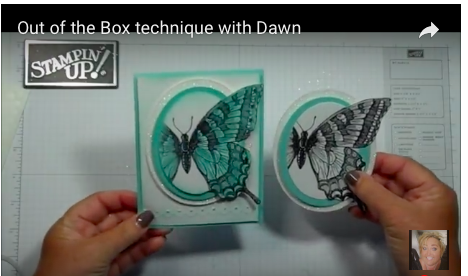 DAWN’S OUT OF BOX CARD/VIDEO Ok I am leaving this with the title that she gave it but if it was just me… I’d say its the INSIDE OUT CARD..(its also a very old video).this is basically a regular card with a cut out on the front and an image in this its a butterfly but it could be a flower or a frog or a bear or whatever you want… and what happens is the half of it is inside the cut out and the other half of it is OUTSIDE…. it gives such a great dimension to the card . But the truth of the matter is it’s really just an optical illusion. 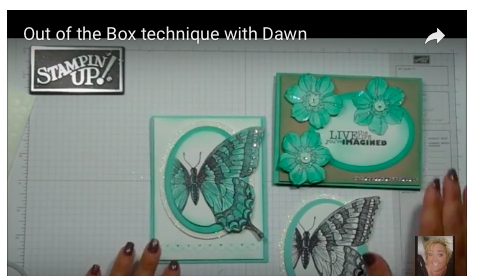 In the case of the butterfly you do have to cut a part of it out by hand then layer it onto the front of the card and while she shows you two images of two different cards….the flowers aren’t …AND actually one the one on the left is done the way of the butterfly the other two are complete cut outs and applied at the end. ( to me anyway ) as impressive as the butterfly so I am going to suggest just go with one image and make it bigger even if you have to hand cut a bit of it…. Ok so there you have it and you can look thru your images and see what you can find that might work… it might work better with a circle or a square so give it some thought and see what you can come up with… I think the flower would have worked better if she had put it at the top or bottom of the oval and only had the one…or had smaller ones on the outside… but give it a try and of course if you make ones you can post it the comments or a link to it and share it with me.